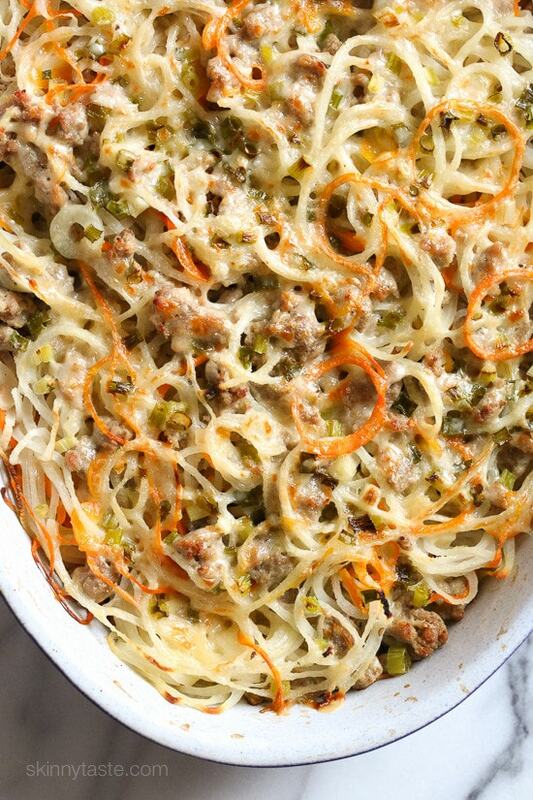 Spiralized turnips, carrots and potatoes baked with turkey in a light cream sauce finished with grated Gruyere cheese – a dish worthy for your Holiday table. 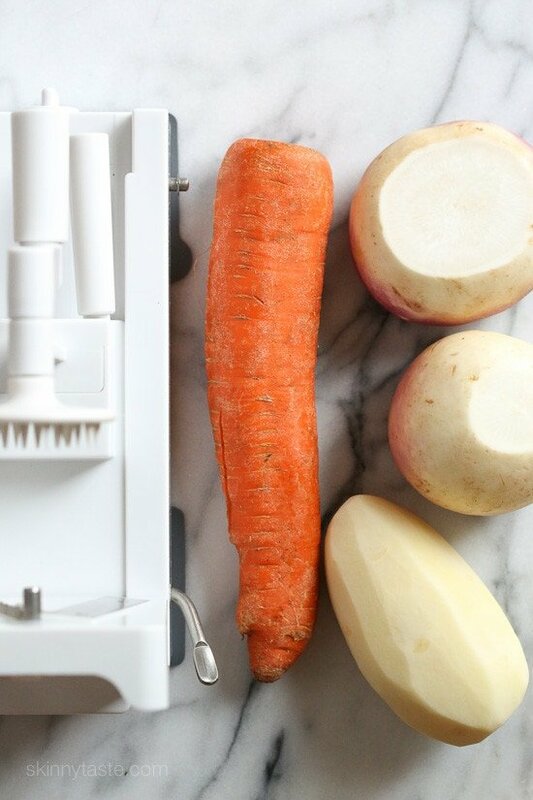 Not only is this dish a fraction of the calories of a classic gratin, it’s also so quick and easy to make thanks to my favorite cooking gadget, my spiralizer (a kitchen must!). I found a monster carrot at the farmer’s market – perfect size for spiralizing since vegetables need to be at least 2 inches in diameter. If you can’t find a fat carrot you can buy a bag of shredded carrots to use here instead. Not all spiralizers are created equal. 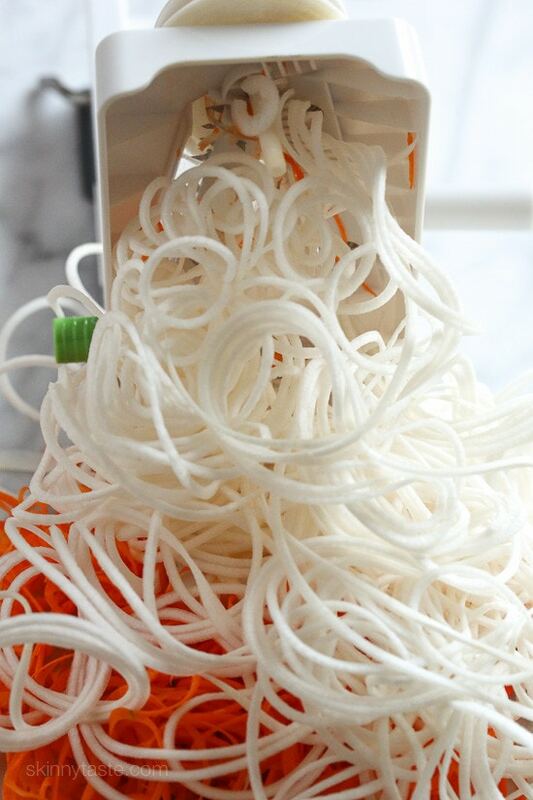 Yes, the hand held ones work great for zucchini, but when you plan on spiralizing tougher vegetables, investing in a decent spiralizer is worth the extra price because it’s effortless. I own two and both are great, the Paderno Spiral Vegetable Slicer, and the Inspiralizer. Inspiralizer is the better of the two (pictured here) because the suction to the counter is outstanding and all the blades are attached, so it’s more compact and easier to clean up. Preheat oven to 375 degrees. Spray a 14-inch oval casserole dish with cooking spray. 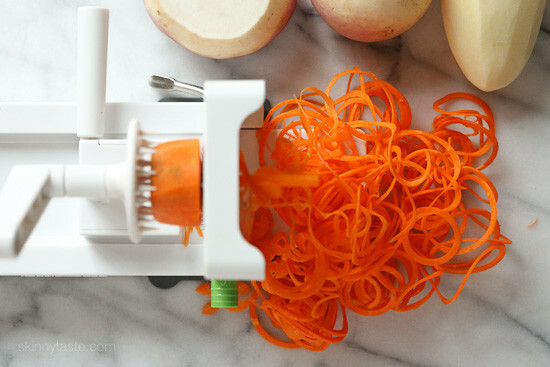 Spiralize the carrot, turnips and potato with the thickest noodle setting of your spiralizer, cutting the spirals into 8-inch lengths. 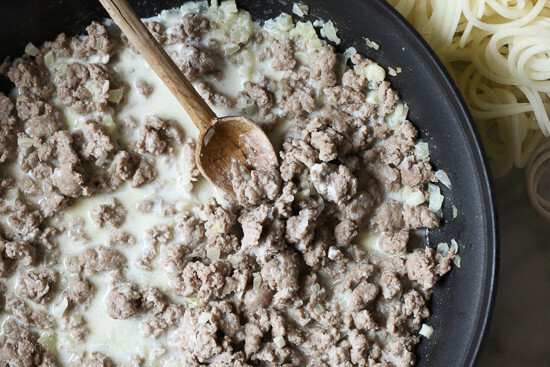 In a small pan bring the half and half, milk, ½ tsp salt, thyme and rosemary to a simmer over medium-low heat for 5 minutes, set aside. In a large nonstick pan, melt the butter and saute the chopped onion and garlic in butter for 5 minutes, add 3/4 tsp salt and pepper. 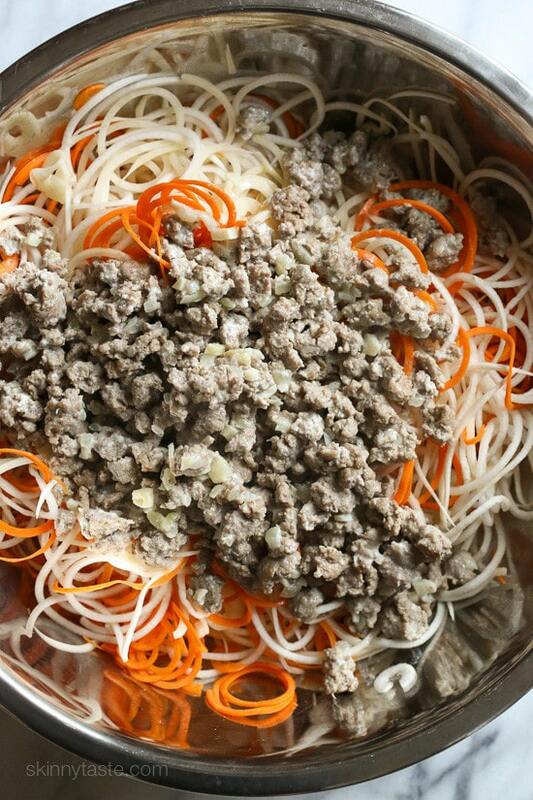 Add the ground turkey and cook on medium-high heat until browned, approximately 10 minutes. 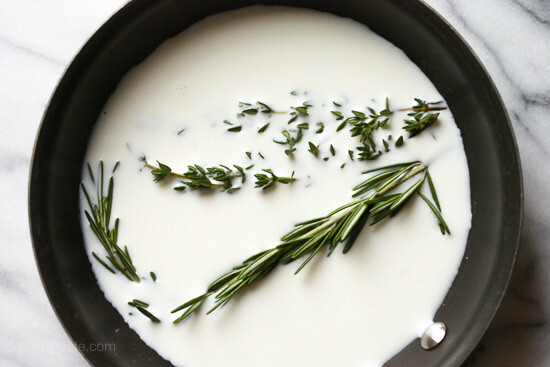 Remove thyme and rosemary leaves from milk and pour milk mixture onto turkey, simmer 3 minutes. In a large working bowl combine the spitalized turnips, potatoes and carrots along with meat and the milk mixture, combine well. 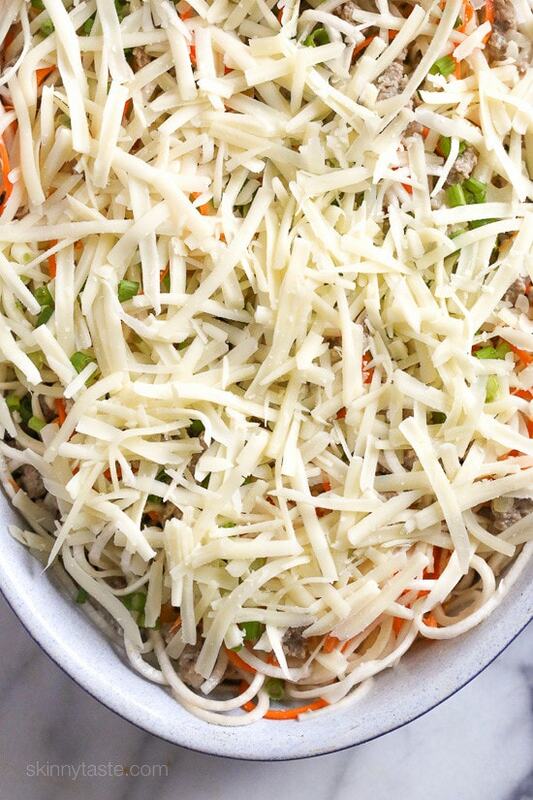 Pour into a casserole dish, top with scallions, and gruyere cheese. Cover with foil and bake 1 hour, uncover and broil on low for 5 minutes, or until golden on top. 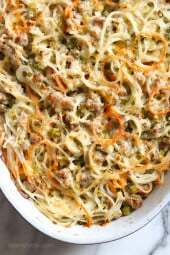 Can I use leftover cooked turkey instead of ground? It looks like a great use for Thanksgiving leftovers. I love this recipe. My husband doesn’t like spiralized vegetables so I use my food processor’s electric dicer attachment and dice them (at 91 it is easier for him to chew). I couldn’t find the recommended cheese so I use sharp cheddar. Use one pound of turkey because it comes that way in our far West Texas grocery store. Have enough for two or three meals for us. Freezes well, too. Thank you for this super recipe. It is a favorite. I made it again as a side dish without the meat and it was wonderful. Used Silk unsweetened Cashew milk and laughing cow wedges-just a couple and it has plenty of flavor and was great. I put calorie count in Fittness Pal for a no meat version and with ingredients used and amounts this time. Only 85 calorie per serving of 6. I made this with rutabaga , red potato and grass fed beefExcellent!!! How do you think this would turn out without the turkey? Do you think it would be dry? Trying to make it vegetarian. I am absolutely in love with your recipes and this one was wonderful. Made it tonight for my husband and I and he loved it too! Only change I made was that I added leek (with the onion, I had several from my CSA that I needed to use). I was a little bit afraid that this would be bland, but it actually had quite a bit of flavor (hurrah for Gruyere!). I did add a pinch of cayenne to the turkey while I was browning it, and that amped things up nicely. 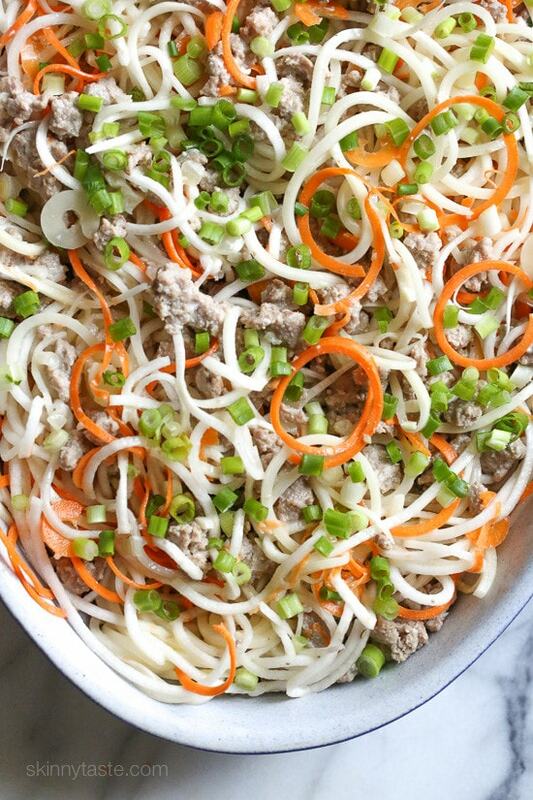 It works well to do a half recipe in a smaller 1 1/2 quart oval cooking bowl. I bumped up the veggies a bit too, to add bulk without fat or protein. My husband liked it a lot, so there you go! Wonderful! The thyme also adds great flavor. Can you freeze the cooked version? Looks Delicious! Can this be prepared in advance and cooked another night? "I own two [spiralizers] and both are great, the Paderno Spiral Vegetable Slicer, and the Inspiralizer. Inspiralizer is the better of the two (pictured here) because the suction to the counter is outstanding and all the blades are attached, so it's more compact and easier to clean up." It's in the oven now! Can't wait to taste it! Smells great! Wow, looks really tasty. I can't help my mouth watering. Made this yesterday and we all loved it! my 1 year old went crazy for it! Thanks Gina! It's in the oven now! I substituted sweet potatoes for regular potatoes. And, added 2 links of sweet apple chicken sausage. It looked so good going into the oven! I don't like turnip – could I just use potato and carrot perhaps? 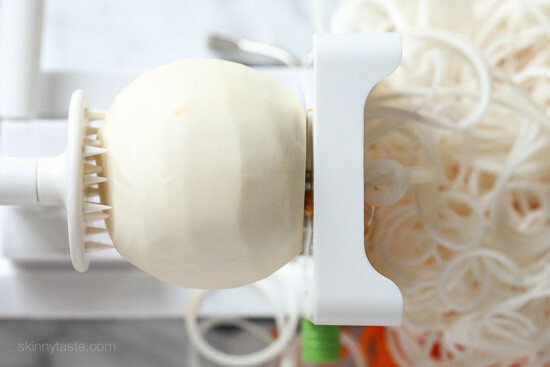 I get my Paderno Spiralizer in 2 days and can't wait to try it!! Do you know how many points it would be if the turkey were removed to make it a vegetarian dish? My husband won't eat carrots, do you think I could substitute a sweet potato for the carrot? I love gruyere but find it hard to find at the grocers. Do you have an idea for substitution? Trader Joe’s has a combo of Swiss and Gruyere shredded. 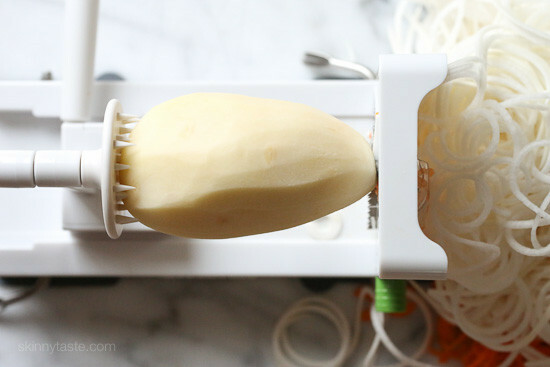 It is great for this but adds a nice zest to homemade mac and cheese too! That looks so so good ! I am being a pain but wonder if we could replace the half-and-half by a vegetal option by chance ? I am sure they sell dairy free creamers out there! I am dairy-free and made this last night with cashew milk (plus a little cornstarch), olive oil butter, and lactose free cheese. It came fantastic! Thanks for another great recipe!